Logitech Internet Chat Headset, as its name implied, is a headset designed for Internet chat, and can be used as normal headset for computer, music listening and multi-player gaming. Logitech Internet Chat Headset features rich stereo sound, a noise-canceling microphone, in-line volume/mute controls, behind-the-head design, 9-foot cable, and has four interchangeable colors. 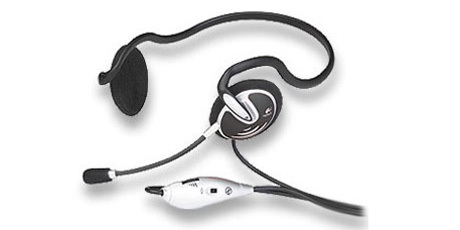 Comes with stereo headset with microphone, 4 interchangeable headset caps and switching tool. ComputerAct!ve (dead link) reviews Logitech Internet Chat headset and concludes with rating of 2 out of 5 that the real problem here is the price. Although this headset gives high quality sound, the difference in quality between this and a far cheaper set is not enough to justify its high price. The headset is easy to install.